4 Persian Kingofkings of the Persian Empire. 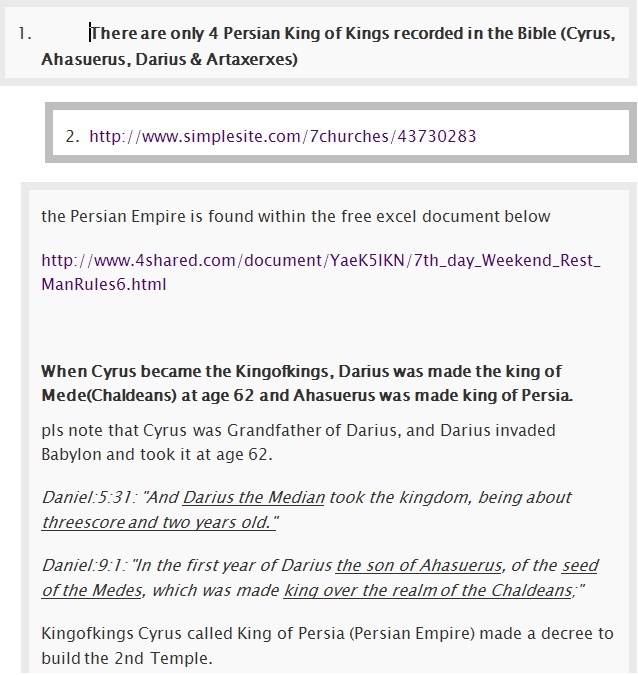 historians had reused the same names of Cyrus/Darius/Ahasuerus/Artaverxes and named them as CyrusII/III/IV DariusII/III/IV, XerxesII/III, ArtaXerxesII/III etc and extended the Persian rule by few hundred years. 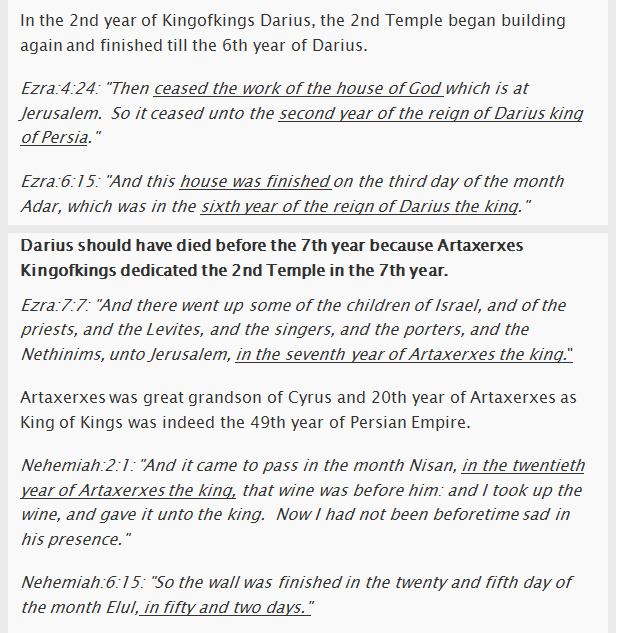 In Ezra chapters1-3, Ezra's immediate father Seraiah[Ezra1:2b] saw the 2ndTemple's foundation and CRIED becuse he saw 1st Temple 70year ago. [Ezra3:12]. 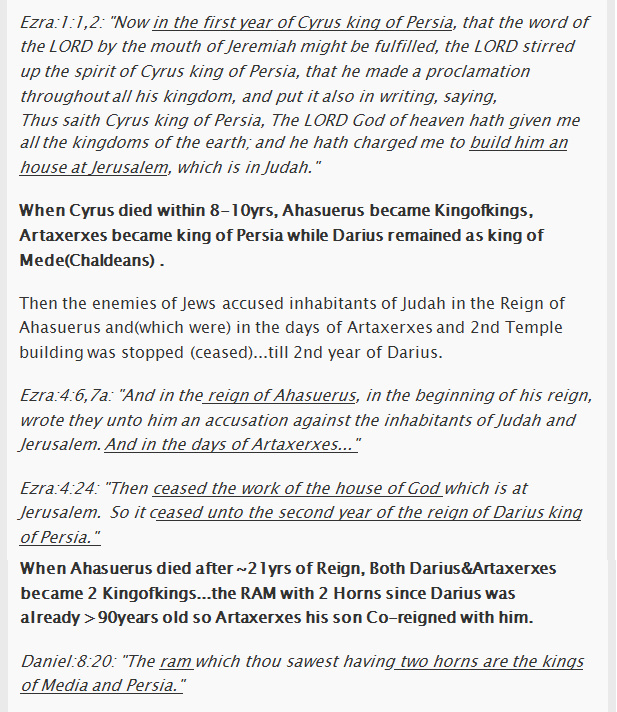 1)Ezra was not mentioned who came to Jerusalem after Cyrus' DECREE. Joshua after 70yrs of exile. Ezra with Nehemiah dedicated the 2nd Temple. on the 20th year reign of Artaxerxes. 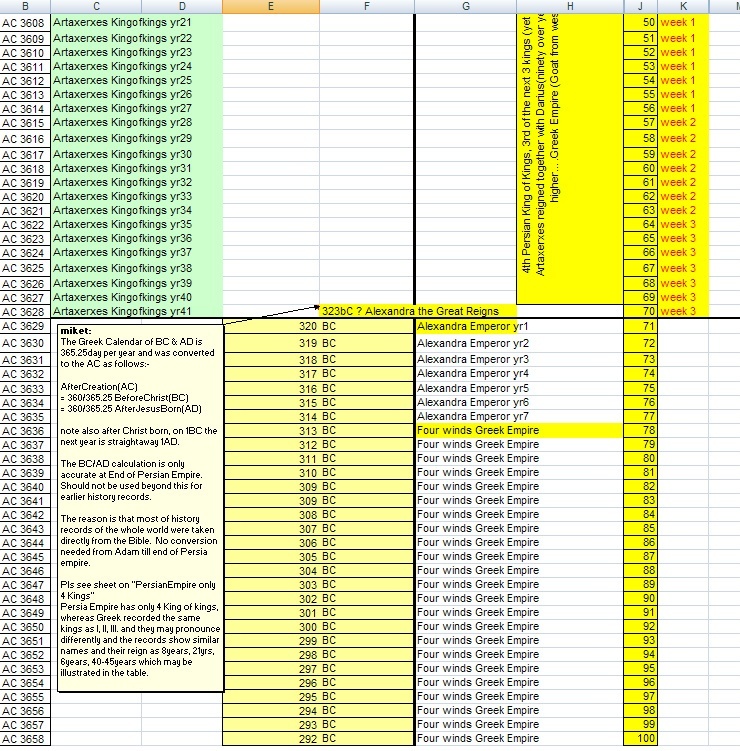 4)the WALLs was fullied also in 7weeks literally 52days. 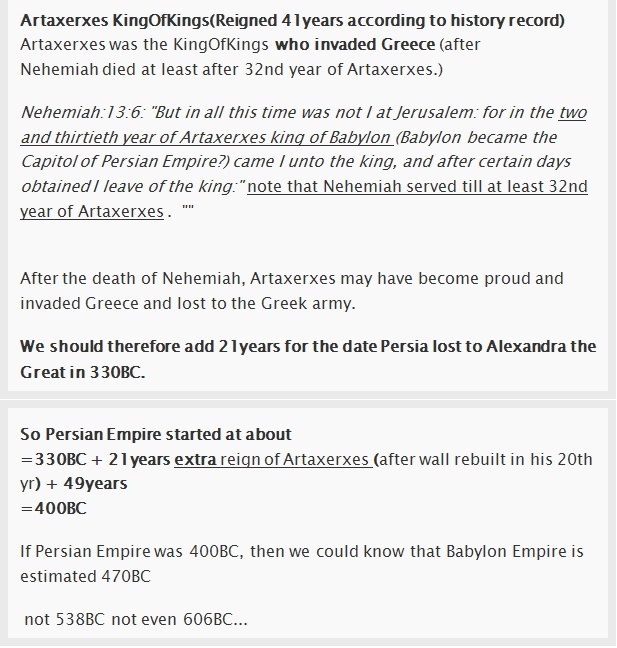 6)Artaxerxes was found by historians to reign for the longest period for about 40years and he could be the LAST king of Persia who LOST the BATTLE against Alexandra the Great. the Greeks might have named him DARIUS instead. Asian countries are commonly called by their Father's name first. US citizens call their Father's name last. 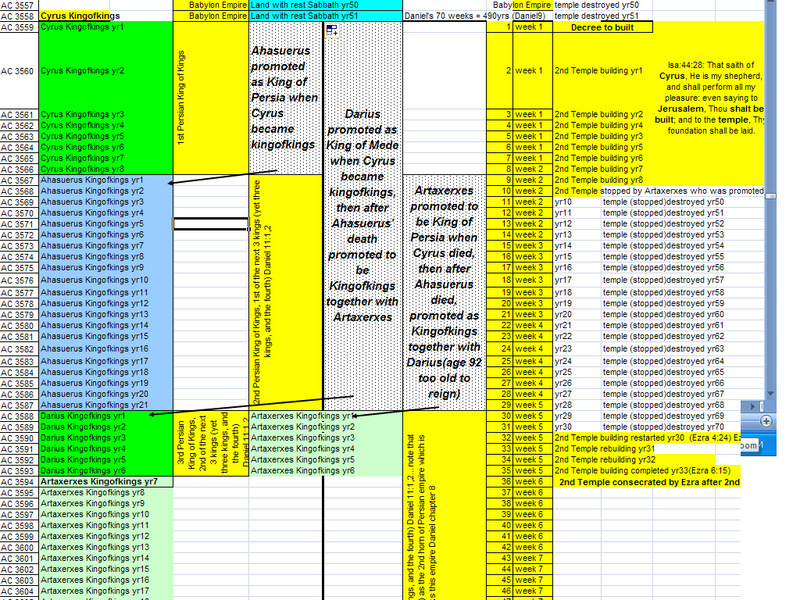 7)Alexandra the Great conquered Persia in 330BC as recorded by historians. till WALLs rebuilt during Nehemiah's time in the 20th year of Artaxerxes. or 397years from Christ's birth. Jesus was cutoff after 62weeks. Note that the 7weeks HAD PARALLEL fulfillment. still awaiting a 2nd fulfillment which started in 1967AD and WALLs will fall during 6th seal event...then 49th year which is 2016AfterRapture...Jews will rebuild the WALLs again. 10)The BIBLE confirmed MESSIAH was cutoff AFTER 62 weeks and not 69weeks which is ADDED by many many who added to the WORD of GOD.